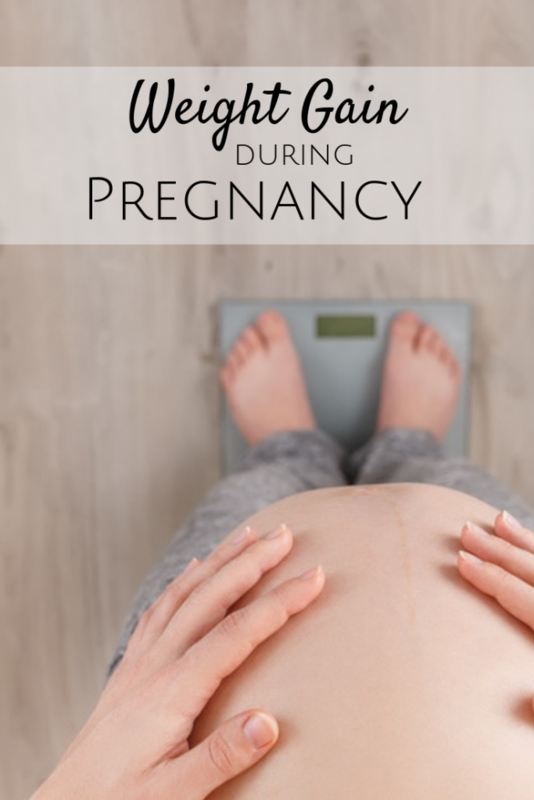 The amount of weight you should gain during your pregnancy varies depending on your pre-pregnancy weight. Weight is grouped into categories based on BMI, which measures your weight relative to your height. To determine your BMI, you can use a BMI calculator. Remember to use your pre-pregnancy weight, not your current weight if you’re already pregnant. The Institute of Medicine (IOM) pregnancy weight gain recommendations are shown on the image below1. It’s important to stay within the recommended weight gain range. Gaining the recommended amount of weight leads to better pregnancy outcomes. In fact, there is a strong link between gestational weight gain and preterm birth & birthweight variations (low birthweight, macrosomia, large-for-gestational-age, and small-for-gestational-age)2. To gain the appropriate amount of weight, the IOM has broken it down the same pre-pregnancy BMI groups. Underweight and normal weight women should gain about 1 pound per week during the second and third trimesters. Women in the overweight category should strive to gain about 2/3 of a pound during the second and third trimesters. There is no set recommendation for women in the obese category except that total weight gain should be 11-20 lbs. Weight gain during the first trimester should be minimal (1-4 lbs)3. To break it down even more, underweight and normal weight women should add an additional 500 calories during the second and third trimesters. Women in the overweight BMI group should add an additional 300 calories during the same time period. And when adding those extra 300 or 500 calories, remember that quality matters. Lean protein, fruits & vegetables, and whole grains would be great choices to fill up those extra calories. Curr Opin Obstet Gynecol. 2009 December : 21(6): 521-526. doi 10.1097/GCO.0b013e328332d24e. Viswanathan M, Siega-Riz AM, Moos M-K, Deierlein A, Mumford S, Knaack J, Thieda P, Lux LJ, Lohr KN. Outcomes of Maternal Weight Gain, Evidence Report/Technology Assessment No. 168. (Prepared by RTI International–University of North Carolina Evidence-based Practice Center under Contract No. 290-02-0016.) AHRQ Publication No. 08-E009. Rockville, MD: Agency for Healthcare Research and Quality. May 2008. “Weight Gain During Pregnancy: Number 548.” ACOG. American College of Obstetricians and Gynecologists, 1/13/2015.